In summer 2017 Bayer Leverkusen looked to fill the gap left up front by the departure of Javier 'Chicharito' Hernandez to West Ham United by bringing in Lucas Alario from River Plate. The 25-year-old was a regular source of goals for the Buenos Aires club – and some important ones at that. bundesliga.com has collated ten things you need to know on Die Werkself's new Latin American goalgetter. Lucas Nicolas Alario was born on 8 October 1992 in the small city of Tostado and in 2010 he made the 200-mile move to Santa Fe to join Atletico Colon. After four years in the provincial capital, he headed to Buenos Aires, the country's capital, to sign for record Argentine champions River Plate. Happy 112th Birthday, Colon! All the best to everyone there! Alario has always had an eye for goal. In 105 league appearances for Colon and River Plate, the rangy striker found the back of the net 34 times as well as providing 13 assists. Bear in mind that not all of these appearances have been as a starter, and that he made his Colon breakthrough in a side battling relegation, and those numbers start to look even more impressive. The forward has scored in every competition he has competed in to date. Twenty-eight goals in the Argentine top flight and six in the second tier have come alongside strikes in the Copa Libertadores (eight), Copa Sudamericana (one), Recopa Sudamericana (one), FIFA Club World Cup (1) and recently one for the senior Argentina squad in a 6-0 friendly win against Singapore. No doubt the Bundesliga will quickly be added to that impressive list. Alario played with an old Bundesliga favourite at River Plate: Javier Pinola, who spent a decade with Nuremberg and even captained Der Club. The left-back returned to his homeland in 2015 with Rosario Central before joining Alario at Los Millonarios. Alario will certainly have sought out Pinola for his advice before committing to Bayer. Unlike his Leverkusen predecessor Chicharito, who is more of a goal poacher, Alario is a more rounded striker. Confident off both his left and right foot, the Argentine is also a handful in the air. His style of play has drawn comparisons with Ivory Coast legend Didier Drogba, although he perhaps lacks the physical strength of the former Chelsea man. That said, his game will bring more to the table for Leverkusen than Hernandez through the middle, while he also represents another option out wide with his assured touch and pace. In 2016, Alario made his debut for Argentina in a World Cup qualifier against Uruguay, a game in which Lionel Messi scored the only goal. Following the match, Argentina coach Edgardo Bauza sang the youngster’s praises, claiming that "Alario is a player with a great future ahead of him. It’s good for him to keep experiencing being a part of the Argentina squad." He scored his first international goal under Bauza's successor, Jorge Sampaoli, against Singapore in June 2017. Alario needed little time to bed into his new surroundings following his move to River Plate in 2015 and quickly became a fan favourite with the Buenos Aires club after scoring two important goals. He netted the equaliser in the Copa Libertadores semi-final second leg against Guarani to put his side into the final before opening the scoring in the final against Tigres as River ran out 3-0 winners to claim their third continental title. In a country producing such an array of attacking talent as Argentina, breaking into a national team featuring the likes of Messi, Sergio Aguero and Gonzalo Higuain is no easy feat. Nevertheless, Alario has done that and it is just one of the reasons he was named as the only player not based in Europe to feature in goal.com's top 50 players in 2016. Quiz: How well do you know Bayer Leverkusen? It's not often you get to come up against your idol on the pitch, but Alario got that chance in the 2015 Club World Cup final. Barcelona’s Luis Suarez was River Plate's tormenter that day with two goals in a 3-0 victory, and Alario has since explained he has watched Suarez closely to learn from him. Now he will have the chance to study two of the world's top strikers – Robert Lewandowski and Pierre-Emerick Aubameyang – at close quarters. For all you gamers out there: did you know that Alario's overall rating on FIFA 2016 was 67, improving to 77 in the following year's edition? That went up to 78 when FIFA 2018 was released in September 2017, and rose to 82 with the latest upgrade. Chances are, he'll keep getting better too - both in the gaming world and out on the pitch. 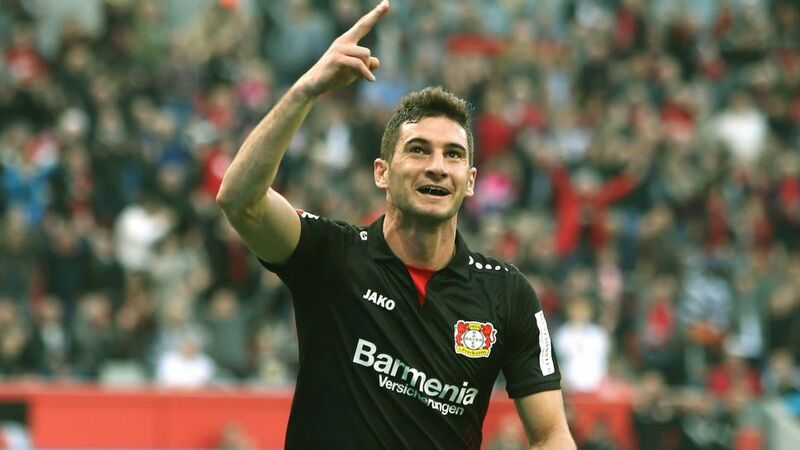 Click here for more Leverkusen news and features.